I have a little secret to tell. I’ve been feeding my girls pink mash and green mash since they were little. For years they thought fairy dust made it different colours. In fact for birthdays we did have a touch of the edible glitter on top. Little did they know I mashed in beetroot and spinach to get the colouring and give them a little nutritional kick at the same time. When they found out, they’d been eating it so long that they didn’t think to go “Ewwwww!” and stop. It tasted fine after all despite having their least favourite veggies inside. Now they are a little more grown up but the wonder of seeing coloured mashed potato never fails to light up their little eyes. This time Mummy’s not added fairy dust or any secret ingredients. 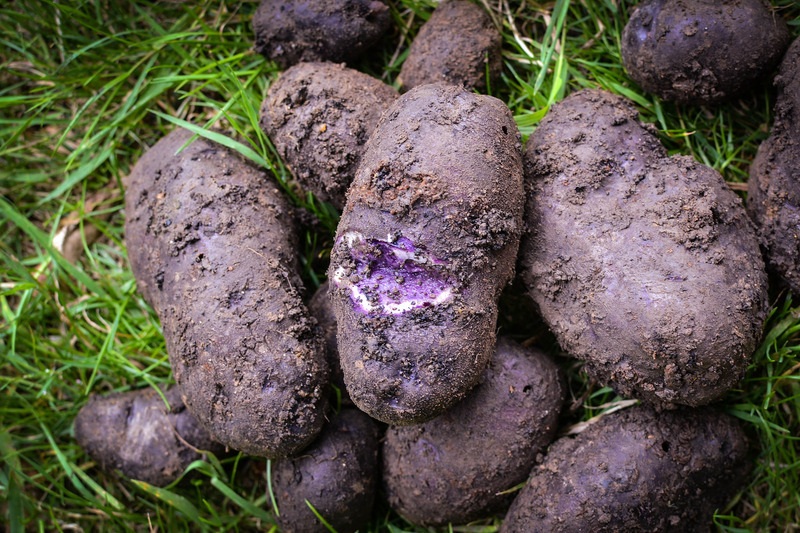 The potatoes really are purple. The variety we grew is called Purple Majesty. This is a hybrid cultivated from native Peruvian purple potatoes which grow high in the Andes. They contain tonnes of anthocyanin which you’ll also find in superfoods like blueberries and pomegranates. 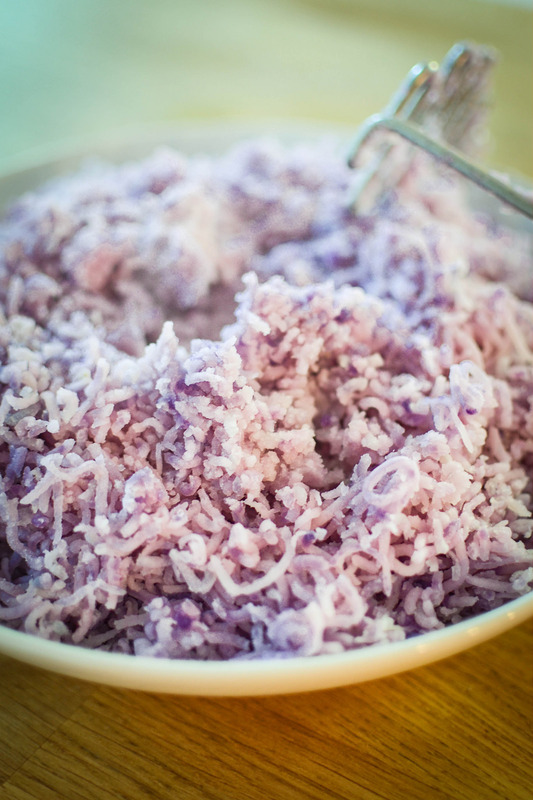 These are said to boost immunity and in view of the flu season about to descend on us, I would much prefer a plate of mashed purple potatoes than a flu jab! Peeling them is rather fun. I felt a little like Violet Whatshername in Charlie and The Chocolate Factory as my hands took on a tinge of purple. They looked rather bruised. The cooking fluid goes a little blue which is a bit disconcerting but I have been assured by my (chemistry teacher) husband that this is the natural pigment coming out much like beetroot. The skin and flesh is just gorgeous. Aside from the mash, they are pretty on and in bread. They retain their purple looks and so I made some focaccia with rosemary from the garden. It was very satisfying using two ingredients completely grown from seed. Put the flour, salt and yeast into a mixer and mix together. Add the olive oil and water and mix again until it all comes together into a wet dough. Leave to rise until it is double in size. Knock back and then plop into an oiled roasting tray. Push out the dough gently into a flat rectangular shape and then leave to rise again for about 30 minutes. Meanwhile preheat the oven to 200C. Dimple the surface of the dough and push in some short sprigs of rosemary. Thinly slice (about 3mm thick) the potatoes and place them evenly around the bread. Give them a little push into the dough. Drizzle the whole thing with olive oil and then bake for around 20 minutes til golden brown. Drizzle again with some olive oil and sprinkle over some sea salt if you wish. I tend to leave it off if the girls are eating this. Have you grown any purple vegetables or fruit this year? Do you have any tips for growing potatoes? I’ve never had purple pots! Definitely want to try them now and the bread you made looks fantastic! Purple potatoes, why did I not think of that 😉 My kids don’t eat mash potatoes. This will be a two in one, colorful potatoes without the nasty artificial colors and you say they boost the immune system, then I’m all in. Thanks! That has to be the prettiest focaccia I’ve ever seen. 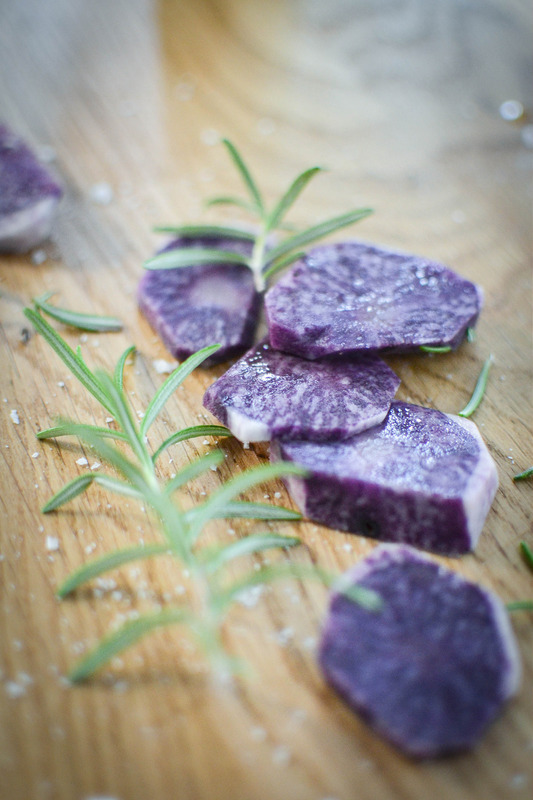 I never even knew purple potatoes existed – I’ll have to look out for them at the next farmer’s market! Awww thank you. It tastes nice too with the Rosemary. The potatoes are most certainly worth seeking out. Those look amazing, you’ve reminded me I still need to pick my beetroot! I’d never seen purple potatoes until Jamie Oliver did something with them years ago and for a while, Delia style you could buy purple potatoes in Sainsbury’s. They seem to have mostly disappeared now although occasionally I spot them in Waitrose. They look awesome in your foccaccia! Thank you. Yes most certainly worth seeking them out. Simply beautiful Urvashi. Can’t say I’ve tasted purple potatoes very often but now yearning for some violet-flecked mash or baked into gorgeous bread. Lovely pics. Thank you Sally. I’m obsessed with the colour. I wish I had planted more. Just gorgeous, love the finished focaccia! I’m not sure, and haven’t given the beauty of spuds much thought before now, but they might be the prettiest potatoes I have ever seen! Jewels in the soil, for sure. I’ve been thinking of growing potatoes for a while and will hunt out this variety as my potato debut. 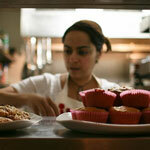 You mealtimes sound magical – edible glitter, what a wonderful touch! Lovely post. Thanks for sharing. Thank you. Anything to get them to eat healthy food in a fun way! 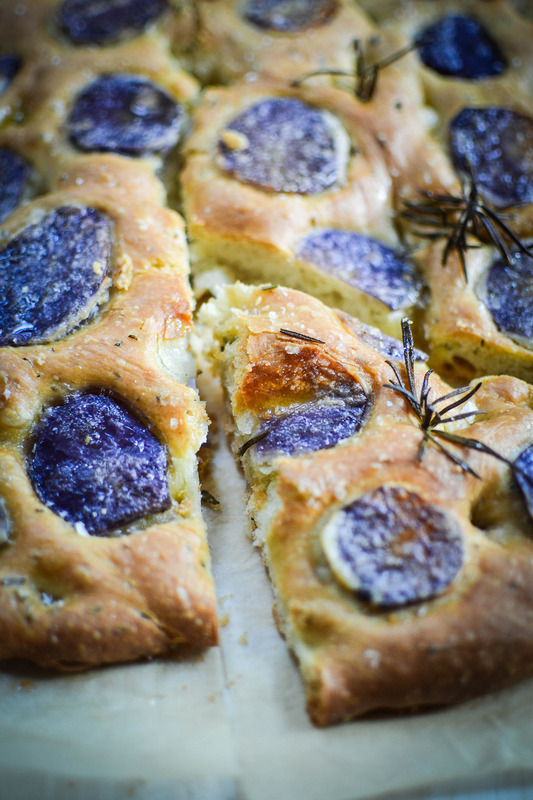 That Focaccia looks stunning Urvashi, those purple potatoes are like jewels – really magical! Oh we also grow purple potatoes and we LOVE them! They are fabulous in potato salad with crispy bacon bits… 🙂 love your focaccia! Thank you. I think it was one of your pics I saw last year on Instagram that made me order them! These are so beautiful! Love the look of that focaccia. Gorgeous photos! Such a pretty veg, but it’s the pink and green mash I am excited about. Why didn’t I think of that. DOH! We love coloured mash. Perfect for little ones. Orange works too with sweet potatoes or butternut squash/pumpkin. Foccacia with potato is my fav – carbs on top of carbs! This looks gorgeous too!